Distributed content promises faster access to individual news items, and higher share-count; the trade-off for publishers is loss of context and control. The more fragmented content becomes, the more important it will be for publishers to increase their efforts to provide context, a recognizable environment that is unique to the brand and the editorial vision it represents. The most important question for publishers is not: which distributed content technologies should I use? but rather: What kind of editorial context do I need in order to implement distributed content without losing ground? It is striking that, whenever distributed content and the evolution of news is discussed, all that seems to matter is speed, and number of shares. Coco Chanel famously said “La mode c’est ce qui se démode” — fashion is what becomes unfashionable, and by the same token you could say what goes viral is what is uninteresting when the next viral thing comes along. If the attitude to news-production boils down to however fast you move, it’s never fast enough, then there are many things publishers are traditionally very good at that get discarded by the wayside – not because they are useless or dead, but just because they create less immediate buzz. Let’s recap: Distributed content is about the promise of faster access to individual news items, as well as driving up the number of shares; the trade-off for publishers is loss of context and control. 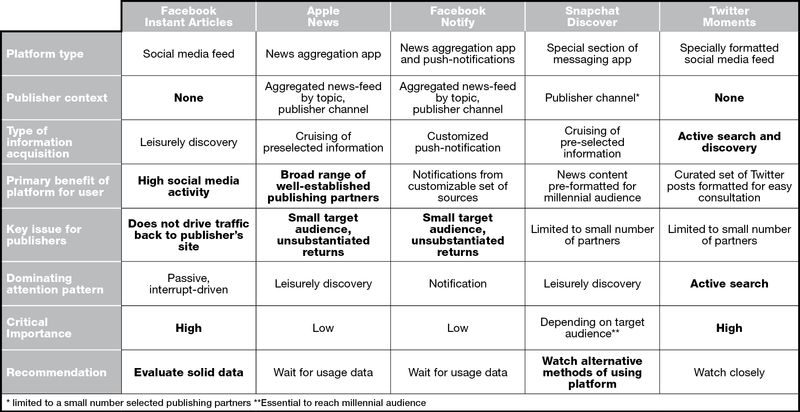 For publishers, balancing these two factors is much more complex than it may initially seem, mostly because, in the race to keep up with the exponential evolution of technology, publishers have less and less time to maintain a coherent and sound editorial strategy that will cover that complete array of content and revenue options that are on the table—and by that I also mean options that may seem to be losing speed or just not growing as fast as others, yet could become meaningful over time, provided they are managed in a lucid way. Extreme content fragmentation has become a reality, and with it the increased need for publishers to provide a stable basis of context, a coherent editorial vision, a sub-structure that connects individual news items, that shows that the reader that there is more out there than a catchy headline and a few lines of text. In the case of newspapers, the print-publication played that role, and in many cases still does, although its material existence is increasingly threatened. The new power-players in the publishing space, Buzzfeed, Vox, Fusion, and a few others are frantically building a comparable substructure, even if in some cases it was not initially in their genes: that’s why Buzzfeed is busy hiring journalists, while Huffington Post is aggressively pushing global expansion. It is for that reason that, when we consider distributed content as an alternative to the current way of putting our content in front of our readers, we need to look not only at the content and its efficiency in getting shared and attracting readers, we need to look at the reader, and at patterns of information acquisition. And this also implies going beyond simplistic assumptions: Oversimplification of the information acquisition patterns at play would have us believe that a reader is a reader is a reader— that clicking on an Instant Article on Facebook is the same thing as looking at what comes in through a Twitter feed, which in turn is identical to consulting a news aggregator like Apple’s News app, or getting an alert from Facebook’s Notify app. Reader behaviour reduced to click, like, share. A woefully limited perception of the highly complex reality of information use. The challenge publishers face with distributed content is two-fold: to make the most out of the specific audience—and the information acquisition patterns that come with it, but also, if at all possible, to fight the extreme content fragmentation proper to social sharing by creating adaptive context along the individual news items. Context is what differentiates a well-respected publication from a site with lots of clickable stories. The considerable buzz around distributed content is based on the assumption that in the future we will not need context; news and content, in this vision, is solely a social phenomenon, and whoever is closest to the pulse of social information propagation is the master of the content-universe. Yet, the more fragmented content becomes, the more important it will be for publishers to increase their efforts to provide context, a recognisable environment that is unique to the brand and the editorial vision it represents. In the end it is all about showing that there is more to the story than the story itself, and that it is worth finding out what it is. How to build context: Use Instant Articles not as a final destination, but as stepping stone to diversified content and context. Recommendation: Evaluate data. The actual benefits of Instant Articles for publishers are still unclear, and the (rare) data that are available are contradictory. Instant Articles may make sense for digital pure players which have decided to be present on every available platform, but established publishers should weigh the benefits and test the waters before jumping right in. Advantage: Apple’s News app has the most comprehensive selection of big-name publishers whose content is often hidden behind a paywall. Particularly on an iPad, Apple’s News app is an excellent way to cruise information. Yet so far, usage data are not encouraging — and Apple has not made any particular efforts of actively marketing News. Recommendation: Wait and see. Apple’s News app received a lot of attention when it was announced, but so far, there is little evidence that the app is making major inroads in news consumption. It is nevertheless possible that, due to the strength of Apple’s brand, the News app will develop a reasonably solid reader-base that is likely to be more involved with the content then average readers on a social media platform. How to build context: Notify does not use the Instant Article format, but rather displays publisher’s web-pages using the built-in rendering engine when possible, and otherwise links to the original website or app. Recommendation: Low priority. Should publishers go for Notify? Not until there is tangible data about the size of the target audience. As it stands today, Notify is clearly an experiment, a step on the way to a comprehensive content offering from Facebook, interesting only if you plan to be present on as many platforms as possible. Recommendation: Watch what other publishers are doing. Since Facebook use is slowing down with younger age groups, Snapchat has become one of the most important platforms to reach millennials. The very exclusive Discover feature (it is limited to 17 partners at the latest count) is not the only way publishers can use Snapchat to get in touch with its core audience. Risk: In its approach, Moments is quite different from the habitual way of using Twitter, but it is less a finished product (or even set of technologies) than a step on the way to changing the way Twitter presents breaking news. Recommendation: Watch closely. While Twitter has been plagued by significant problems over the past few months, the platform is universally hailed as an indispensable tool for breaking news. The curation and presentation technologies behind the Moments feature will become more widely available, and will present an interesting opportunity to build rich context information on Twitter. Don’t expect the distributed content landscape to get any simpler in the near future. Mobile content has become the primary media battle-field, and the advent of native advertising and content marketing doesn’t contribute to making things easier for publishers. In a nutshell: it’s a mess, and it will be for quite some time. If you have been covering technology as long as yours truly, you have learned that it’s a fallacy to assume that new simply replaces old. Publishing is about much more than just producing text, images, or videos for that matter, and posting them in social media feeds. There is a reason why Vice is busy starting TV channels: only if you master “old” media channels as well as the new ones can you cover the whole gamut of what humans like to experience. The future of publishing is not digital-only, mobile-only: if there is one certainty about modern consumers, then it’s that they value choice above all, and that, as one form of content become dominant, this very fact creates and strengthens opposing trends. Take music, for instance: is it really a coincidence that, as music streaming becomes ubiquitous, there has been a widely noticed resurgence of vinyl records – to the extent that vinyl now counts for almost 30% of physical music sales? And in a completely different context, it is interesting that one of the most successful initiatives by the New York Times this year was the distribution of Google Cardboard VR viewers to over a million subscribers, combining the advantages of a print subscription with the cutting-edge aspect of VR reporting. That’s why, for publishers, the most important question they are facing is not: which distributed content technologies should I use? but rather: What kind of editorial context do I need in order to implement distributed content without losing ground? Focusing on mobile as the only platform that has any future may make sense digital pure players – but in order to create context, publishers need to take a step back and factor in every channel of information, and to use every possibility of providing value at their disposal.